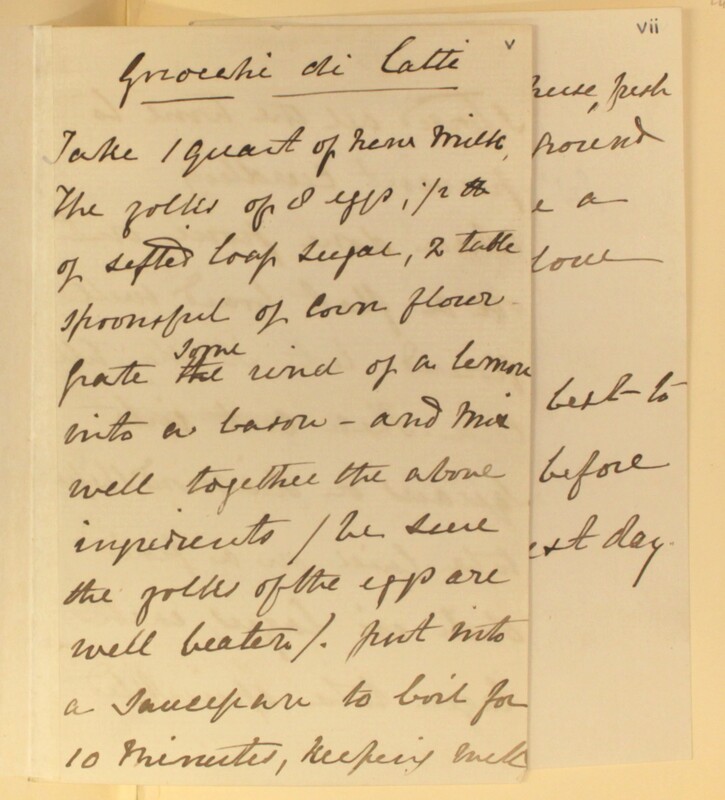 This recipe for gnocchi di latte is the latest of all the recipes recorded in our Cookbook of Unknown Ladies. Properly speaking, it isn’t an integral part of the book: it was recorded on two separate sheets, which were then pasted onto the book’s endpapers. The handwriting and spellings are more modern in appearance than most examples in the book and the recipe itself, with its precise measurements and timings and helpful hints and tips, reads as if it could have been lifted straight out of a contemporary cookery magazine. Take a quart of new milk, the yolks of 8 eggs, ½ lb of sifted loaf sugar, 2 tablespoonsful of corn flour. Grate some rind of a lemon into a bason and mix well together the above ingredients (be sure the yolks of the eggs are well beaten). Put into a saucepan to boil for ten minutes, keeping well stirred all the time to prevent curdling. When done, pour out on a flat board well floured. Let it stay till cold. Then, cut into squares or diamond shapes to be laid on a flat dish in layers, each layer to be sprinkled with Parmesan cheese, fresh butter & a little ground cinnamon. Bake a delicate brown colour in the oven. We found it best to make the night before and cut the next day.